A suspect that was sleeping in the fine arts building on UWM's campus was shot by UWM Police, after an altercation. An investigation is underway for an officer-involved shooting on the UW-Milwaukee campus Tuesday morning. Police say that upon responding to reports of an individual sleeping in the Fine Arts Complex building, a physical altercation ensued and they discovered he had a weapon. The type of weapon was not specified. Officials clarified that the incident only involved one suspect and he is currently in stable condition. Two officers were taken to the hospital with minor injuries. 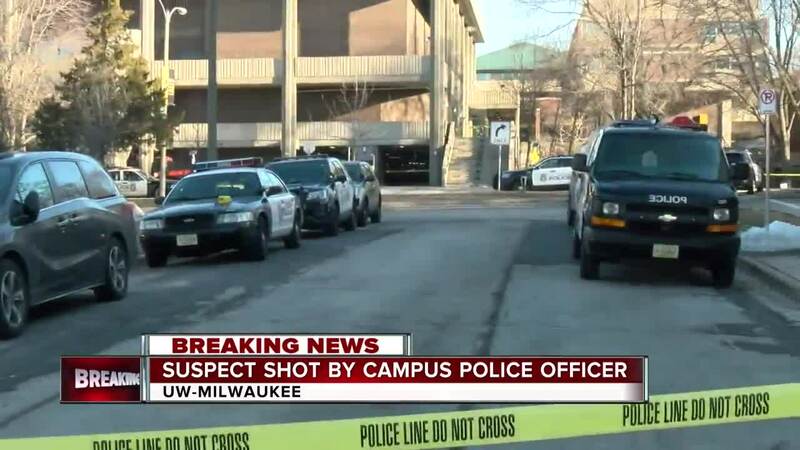 A UWM police officer shot an individual outside the Fine Arts Building. No students or employees were hurt or involved in the incident. An investigation is underway. According to a safe alert sent out by UWM, shots were fired by the fine arts loading dock near Kenwood and Stowell around 7 a.m.
UWM Safe Alert: Subject is no longer at large. Please stay away from the Fire Arts Complex. UWM is currently on spring break. The Fine Arts Complex and the Helene Zelazo Center were temporarily closed but have since reopened. Police ask that any witnesses who may have heard or seen the incident come forward by contacting 414-766-7631. Oak Creek Police will be leading investigating efforts.